There are owners who don’t operate, but at some point every company has an owner who does. Operate. Operating the business isn’t about thinking. It’s not as high brow as some may think. It’s the grunt work done every hour of every day when we’re faced with another flame that pops up unexpectedly. It’s the daily grind of business ownership, entrepreneurship. Shouldering the financial responsibility it hard work. Only a micro-segment of business owners are well known. Most of us are completely anonymous, operating in small circles where only a few (or few hundred) people even know who we are. Some years ago I was happy to read Carol Roth’s book, The Entrepreneur Equation. Because she didn’t paint business ownership with the glamorous brush so many do. She was candid, truthful and honest. It’s not for everybody. And there are many reasons for that. Chief among them may be the ability to accept risk and embrace the stress of problem-solving on the fly. Successful business owners have to learn to accept decision-making with incomplete data. We have to know enough to make a decision. Then, we have to make that decision. That’s what fire fighting is all about, making decisions in the moment as our business can continue to move forward. But there’s an obvious issue that doesn’t get the discussion it deserves. To be skilled requires learning, but first it requires desire. Don’t fall in love with starting or owning a business because today’s culture puts a premium on it. Millions of business owners could earn more money by getting a job. Millions more will lose money in the effort. You’d better make sure you’re in touch with what you really want and who you really are. It takes just as much courage to say “no” to entrepreneurship as it does to say “yes.” Your desire to fight fire is central. These days my work is intensely focused on business owner decision-making. Because that’s really all there is. Talk with any successful business owner and they’ll confess that they spend most of their time, every single day, putting out fires. Translation: they spend their days making quick decisions on the fly with incomplete data, but just enough to give them some sense of what they should do. Sure, sometimes decisions take longer. And require more data gathering. Most decisions are important, but they’re not “bet the ranch” scale. So if we get them wrong, we know we’ve got enough margin to fix them later. But sometimes we face a fire that we know we need to get right because if we don’t, it may be costly, difficult or impossible to fix without a high price tag. Real-time problem solving is the superior skill. It hinges on how people are wired, on our experience and our learning. Or our willingness to learn. It also requires great data gathering skills, which means listening. Superior fire fighting skills include the ability to get to the heart of the matter by asking good questions. Then, listening to the answers and asking more (perhaps deeper) questions. The most successful business owners I know embrace the need for speed, but not at the expense of learning from others. Successful fire fighting requires just enough patience to get to the crux of the issue so you can make a decision, then make sure it gets done. Not all fires are created equally so a great business owners won’t tackle the fire without first learning more about it. The goal is to put it out, or at worst – contain it while you engage more resources to extinguish it. Skilled fire fighters don’t make it worse, but sometimes business owners do. We have knee-jerk reactions, don’t listen to others, don’t gauge the feedback we get, have our mind made up before we know the facts — many weaknesses cause us to let a small flame flare up into a raging inferno. 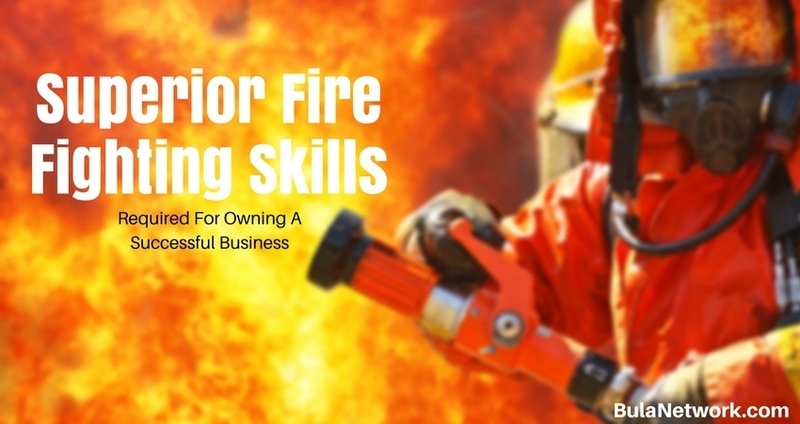 Successful businesses are made that way because at the helm is an owner with superior skills at putting out fires. The visionary may get all the business press praise, but it’s the daily, grind-it-out, fire fighting owner who is making success happen. Are you the owner of a small-medium business? Do you want to become a superior fire fighter — a more skilled decision maker? That’s the goal of THE PEER ADVANTAGE, a virtual peer advisory group of just 7 owners from around America, who help each other grow as owners so they can grow their business.